But that’s going to change. In case you missed the announcements, Form of a Question will be out NOVEMBER 14th in comic shops and NOVEMBER 20th everywhere. I have events planned for six months down the line, and there will be lots of details here and elsewhere. I also went to New York for NYCC, which was a total blast full of old and new friends and some extraordinary nights on the town. When you’re up at 1:30 in the morning reading poetry out loud in somebody’s apartment and you feel you’re meant to be there, you can say that life’s going pretty good. But for right now, and this is what this post is about, I’m NOT writing. Trust me, I would rather be writing. But we live in unusual times, and that calls for unusual action on my part. Image obviously via Shutterstock…but I like these big, strong, anthropomorphic individuals. For the past month AND the next two weeks, I have been knocking on doors, calling, texting. Here in Illinois but also in Indiana, Wisconsin, Ohio, Florida, Missouri, North Dakota, Arizona, Texas…shall I go on? All leading up to Election Day. And I am here to encourage anyone who reads this, and is considering who they will vote for, to cast your ballots with a Democratic ticket as opposed to the Republicans. That being said, while I’m going to admit upfront I have a left-wing bias (big surprise, I know), my dad taught me to be an independent thinker, and having a D next to your name’s not going to make me automatically vote for you. Rahm Emanuel, I know you’re reading this, and sorry not sorry. I also follow my fair share of conservatives on twitter along with liberals, socialists, etc., because I want to know what people are thinking and what value it contributes to the national discourse. As I’ve said before, true conservatism has a valuable place in the grand scheme of things. 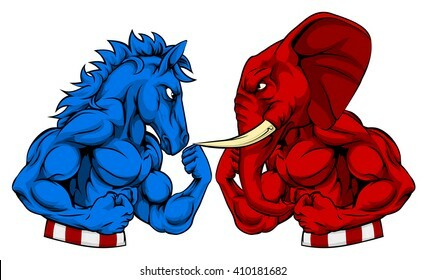 With all of the above in mind, I’m going to tell you that the distinction between the Democrats and Republicans has never been so obviously clear. A lot of my friends have some valid criticisms of the Democratic Party. I myself have valid criticisms of the Democratic Party. But right now there is a golden opportunity for them, and the nation, in that the Dems don’t have a leader. For good or for ill (and I think it’s both), the two people who dominated the landscape in 2016 are not leading. Hillary Clinton has no leadership position and no influence on things. Bernie Sanders goes his own distinctive way. – Possibly even having a TRUE infrastructure week. This is what the Democrats are running on: a series of ideas that will revitalize the social framework of the nation. And the people who best personify those ideas are going to be set up as power figures for 2020 and beyond following the increasingly inevitable change of the guard. Moreover, you know so many of us rediscovered the civic virtue of calling, emailing, and writing to our representatives these past two years? Imagine calling your reps not to say “don’t vote for this” and saying “Vote for this, and possibly make it better” with a Democratic House (and slim chance but possibly Senate) majority? I like imagining that. And what we end up with is not only a true check and balance in the government, but also a series of legislative positions that whoever ends up running for president in 2020 can campaign on as a great message. Speaking of positions and messages, let’s turn to the Republicans. Here I have a key question: WHAT are the Republicans running on? Because when I engage with conservatives on twitter and look at what’s being covered in more right-wing-leaning media, the answer gets murky. The Economy? It’s actually pretty good according to several indicators right now. However, there’s very little about the economy, and almost nothing about the vaunted tax reform bill from the winter that was supposed to be the cornerstone of the 2018 messaging. Because the GOP realized that the tax bill did nothing for the lower and middle classes and only bankrolled the wealthy…which is why Donald Trump is currently talking about pushing through another tax bill that doesn’t even exist. And the deficit has exploded so much that the party of small government has given us no reason to ever listen to fears about the deficit ever again. The truth of the matter is that the Republicans have nothing. No agenda. (You can read this in more detail here.) But it’s somehow worse than having no agenda. For two reasons. First, right now, beyond Robert Mueller, we have no idea what Donald Trump’s personal and business relationships are with so many entities around the world. The New York Times has created a clear picture of Trump committing tax fraud. His unilateral foreign policy moves are empowering China and Russia, which are not really friends of America, and propping up disastrous governments in Saudi Arabia and Israel. And the Republican Party is decidedly incurious about checking and balancing anything Trump does because he benefits them. The Democrats will actually provide congressional oversight. Second, I won’t mince words. The Republican Party is the party that attracts the support of the Proud Boys and such. They are a party of “personal responsibility” that is increasingly determined to regulate the bodies of people and possibly deny civil rights. They have children in internment camps who have to represent themselves in court. Their candidates run race-baiting political ads. They are afraid of the opposition so much that they project everything about themselves onto the opposition and ratchet up fear, to the point where baby boomers in Minnesota are convinced Hispanic gang members will occupy their lake houses. This is to hide the lack of a real agenda. The lack of a pan to fairly govern all and value democracy. The Democrats (especially the rising new generations of Democrats) have something to offer. The Republicans have nothing to offer. The choice in my mind is clear. And I hope this makes sense for many of you as well.